The Type NVF-2 series of handheld directional antennas are used to locate interfering signals or noise in either the 420 – 470 MHz (Type NVF-2A) or the 900 MHz ISM band or cellular telephone bands (Type NVF-2B). 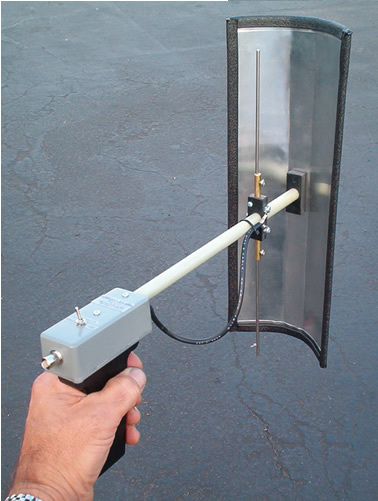 Both models incorporate a solid reflector positioned behind a resonated half wave driven element, both elements being mounted on a fiberglass rod with an integral pistol grip. The configuration of the reflector and driven element are such that a deep null in the signal being received will occur when the antenna is pointed in the direction of the signal being radiated. A T-pad resistive attenuator is also incorporated in the antenna mounting enclosure to aid in the direction finding process on very strong signals or when excessive reflections present multiple returns. For this antenna to be effective, it should be used with a spectrum analyzer, service receiver, or any receiver that incorporates a signal strength display indicator, such as the conventional S-meter. Although highly effective for locating interfering signals, the antenna is subject to multi-path transmission phenomenon (i.e. reflections), repeated observation of the incoming radio signal will be necessary from different locations in order to sort out the true direction of the incoming signal from the reflected signals.